The StartupBros demonstrated how to start selecting products/sourcing/importing/ for e-commerce. Attendees learned a lot for free, but hundreds of you bought into the Startup Bros' full training (I endorse it and I'm an affiliate). Now I'm giving you an inside look of 'what you get' when you buy Import Empire's stellar training. Keep this page bookmarked because I'll add more in-depth reviews of the additional weeks' content as its added to the current Import Empire group. Hello Sir, I’ve been following the startup bro’s for a year now, deeply reading and learning then stopped. Now I’m back and would like to sign up for their startup program, although I don’t see a link on their main website. Can you direct me on how to purchase this program if it still exists . As a beginner does Startupbros show you the basics of signing up a selller account. So from the very first step one? Hi Jordan, as non-US resident total beginner, would you recommend the StartupBros E-Commerce Empire or the Import Dojo Masterclass? They’re both excellent and their value is proportional to their price, so it comes down to the amount you’re willing to invest. In other words Import Dojo Masterclass is signficantly less than Startup Bros. You’ll get all the basics plus more with either program. You’ll pay more for StartupBros but the whole package ‘gives’ you a more robust boot-camp for all aspects of running an ecommerce business. Import Empire is excellent if you are just planning to sell your product on Amazon and you want to stay focused on the Amazon marketplace. Yes even if you have zero experience it is 100% complete for you. How is Import Empire different from “Sourcing Profits” at: http://sourcingprofits.com/join.html ???????????????????????????????? Is this sourcing products from China???????????????????????????? Never heard of Sourcing Profits, but also please note Sourcing Profits looks like a brand new venture/service, where StartupBros have been churning out successful e-commerce/Amazon entrepreneurs for at least 2 years now. Yes it involves (although it’s not required) sourcing products from China. Hi Jordan. Would this course be suitable for people outside of the US. I’m based in the UK. I’m very much a beginner, I’ve started selling locally resourced stock via Amazon UK. Would the PAC be better at this moment, or is this suitable for the inexperienced. Re: Import Empire – Sellers from around the world have already taken advantage of this training (I’ve observed folks with humble beginnings — in France, Thailand, India, Ireland, Panama, Columbia, Canada and more – just crush it with this). PAC is a terrific bargain too, but you may not get all the one-on-one attention with PAC (and you should’t, at that price) that you will with StartupBros. If you’re unsure, get PAC now (they have an ‘anytime’ money back guarantee), check it out, then attend the free Import Empire webinar. Very good and informative video. May I ask if the access to Facebook group, Forums are also lifetime or just for 12 weeks? In the video they show discount for AmaSuite Version3, but the current version is Ver.4 already , they do provide discount on the old version only or they just haven’t updated the picture yet? You said there is deadline date but if I go to your link, looks like its still possible to fill the form and proceed with payment (with discount as well). Can I proceed with application and catch up with current group or will I be moved to the next group? That’s great you learn so much for free, but we all know there’s an end-game here. So really, what is the cost to join the actual program? Please don’t say I have to wait to find out during the webinar. That’s the old style “informational pitch” where they give away enough for you to hang yourself and then tell you how much it really costs to join. If they are a quality group, then the price shouldn’t be an issue. There is no quid pro quo here. As I mentioned in the video: There is no price set yet (I don’t control that). The price in April 2015 was regularly $1997, and it was $998.50 with my discount code. I recently spoke to the founders and asked them if there will be a price increase, and they haven’t decided yet. If there isn’t a price increase, great. If there is a price increase, I suspect it will be modest. Also, they have payment programs (3 or 6 months) to make it more palatable for some folks. Finally, I’m an ardent protester of e-commerce training that costs in the thousands, BUT even if this program cost (say) north of $5,000, it’s still (my opinion) a screaming bargain because of the content/leadership etc. I paid tens of thousands for my Boston University MBA and it (my MBA) is genuinely useless for me, because it was (is?) so out of touch with ‘real world’ use. Hi Jordan. How does this course compare to Jim cockrum’s proven amazon course? can you share your honest opinion please? PAC (http://PACCourse.com) is a great bargain at $299 and provides you everything you need to get started, but if you want real-time, one-on-one help from PAC, you will have to pay $3,500 or more for it (in most instances). Thus If you are someone who doesn’t need much handholding, PAC is fine. Of the two (PAC vs. 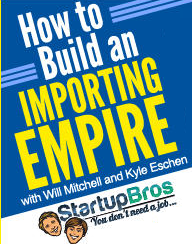 Import Empire), I think Import Empire does a better job covering you/reducing your risk for just about every turn you take during your importing/private label venture . They provide so much step-by-step info, in addition to their one-on-one help, that you could succeed at this half-asleep at your desk). with PAC you will need more self-discipline and be prepared for a couple more hiccups along the way.